SEPTEMBER 11 happened almost two decades ago, yet it still feels like yesterday. A horrible day that changed the world forever, it’s one of those days where most people remember where they were when it happened. For Cindy Barkway, Mother of Jamie ’17 and David, Class of 2020, it's a day she will never forget. Cindy Barkway was five months pregnant when her husband, Dave, a Managing Director of BMO Nesbitt Burns, had to go to New York for a business trip. Knowing that his trip wasn’t overly busy and that there likely wouldn’t be another opportunity to get away before the baby came, Cindy booked a ticket on points to join her husband in the Big Apple. The couple – college sweethearts who married in 1997 – left their two-year-old son Jamie at home with Cindy’s parents, and spent a wonderful Sunday in New York, where they celebrated Dave’s 34th birthday. The next day, Dave had meetings and Cindy walked around New York. They went for dinner together in the evening. That was September 10, 2001. The next morning, Dave told Cindy that he had a breakfast meeting. He kissed her goodbye and left for his meeting. Cindy had some time before her flight home that afternoon, so decided to go for a walk around SoHo. Cindy started to make her way back to the hotel, realizing that she had no way to get in touch with Dave. There were huge lineups at all of the pay phones and people were screaming. With all of the traffic stopped and everyone trying to evacuate, it took Cindy a long time to get back to the hotel in Times Square. Dave wasn’t there. Shortly after she watched the second tower go down, Cindy heard from someone from Dave’s work. They had received a Blackberry text from him saying that he was on the 105th floor of the World Trade Center and that he needed help. It was only when Cindy heard the Chairman and CEO of Cantor Fitzgerald speak that she understood that no one higher than the 90th floor would have made it out. There was no information to be found – and the hard part was still to come. When Cindy returned to Toronto, she had to face Jamie to tell him that his Daddy wasn’t coming home. “My sister brought him out and I just about fainted when I saw him,” she remembered. “I was sad for myself that I had lost my husband, but I was very sad for my kids that they had lost their father. But I also knew that I had to take care of myself so I could take care of my kids. When the baby was born, she named him David, after her husband. The first year was certainly a difficult one, but Cindy made it through, focusing on getting through one day at a time with the help of family, friends and a wonderful community around her. In fact, she never spent a night alone. She speaks to Jamie ’17 and David, Class of 2020, constantly about their father, and his photos decorate their home. But Jamie has no memories of Dave and, obviously, David never had the chance to meet his father. 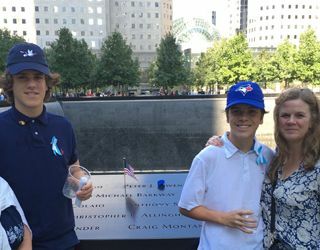 For a decade, Cindy took both boys down to Ground Zero to visit the site and see Dave’s name etched on the memorial. As things got busier in the teenage years, she and the boys would volunteer somewhere for the day. Cindy has had to wear many hats as a single parent. Jamie is certainly proud of his mother. As for Cindy, she continues to push through day by day, embracing her boys and the community surrounding her. Her smile is genuine and lights up her face, although not a moment goes by that she doesn’t think about Dave.